PEORIA, IL - The Peoria Chiefs have announced their theme nights for the 2019 season in the fourth installment of the promotional schedule release. Previously the organization has announced six bobblehead giveaways, 22 fireworks nights and an assortment of giveaways for both kids and adults. A reminder that all promotions, giveaways and themes are subject to change. "We have a lot of new theme nights this season but fans will also see some of their favorites from the past in this comprehensive schedule as well," said Stephen Brown, the Chiefs Marketing and Game Presentation Manager. "Some events are rebranded and we look forward to 70 home games full of entertainment for our great fans." April features Opening Night on Saturday, April 6 with the home opener set for 6:35 p.m. against Beloit. The Chiefs anticipate welcoming their 7 Millionth Fan in team history to Dozer Park that night and a prize package will be given to the lucky fan. There are also three day games in April with an 11:05 a.m. Education Day on April 10, a 12:05 p.m. start on April 17 and NASA Day with a 12:05 p.m. start on April 23. May kicks off with an 11:05 a.m. Education Day on Wednesday, May 1. Saturday, May 4 is the Battle for the Barrel as the Distillers take on the Bowling Green Bootleggers and Sunday, May 5 is Cinco de Mayo. The final 11:05 a.m. Education Day is set for Wednesday, May 15 with Stranger Things Night on May 16. That seven game homestand continues with Hero Night featuring characters from Heroes Inc on Friday, May 17 which also includes a Nolan Gorman Bobblehead. Saturday, May 18 is the annual Armed Forces Night with FREE admission to all veterans who present a valid ID. The homestand finishes with Pokemon Day on Sunday, May 19 and a helicopter dropping Pokemon figures onto the field post game. May finishes with a three-game homestand and Thursday, May 30 is Incredibles Night and Teacher Appreciation Night. The first homestand of June begins with Fortnite Night on Friday, June 7 with Game On mobile gaming experience on hand as well. Saturday, June 8 is Westeros Night as the Chiefs celebrate the final episodes of Game of Thrones. Sunday, June 9 brings the first Princess Day with a post-game Daddy/Daughter dance plus appearances by Jasmine, Belle, Ariel and Rapunzel from A Royal Remembrance. The next homestand starts on Friday, June 14 with Women's World Cup Night and Player Heritage Night. 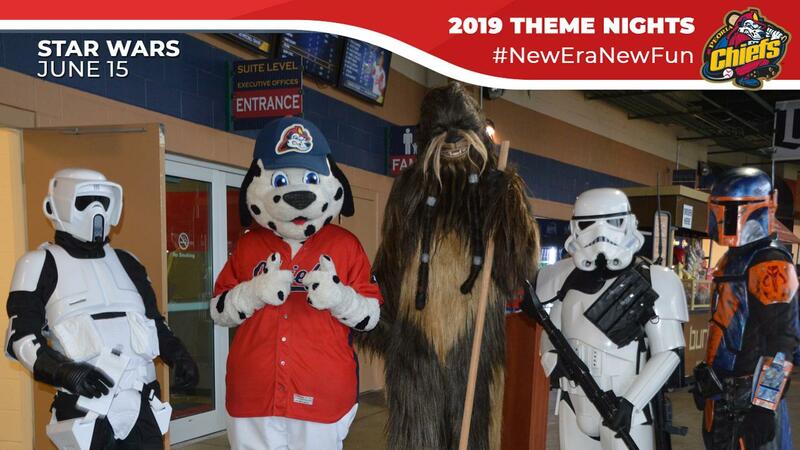 Saturday, June 15 brings the annual Star Wars Night complete with characters from the 501st Midwest Garrison and it is also Illinois CancerCare Night. The first half of the season ends with CAT Day on Father's Day June 16 and a post-game helicopter candy drop. The second half begins with Ghostbusters Night with Ghostbusters Peoria on Thursday, June 20. Friday, June 21 is Jurassic Ballpark Night with a dinosaur appearance. Saturday, June 22 is the first of two Faith & Family Nights in 2019. Sunday, June 23 is PJ Party Night with a PJ Masks characters appearance. Saturday, June 29 is Hispanic Heritage Night with Fiesta en el Rio and a special appearance by the Cardinals mascot Fredbird. The month ends with an appearance by Peppa Pig on Sunday, June 30. The Chiefs are home on July 3 but not the fourth this season so the usual Salute to the USA event will take place on Wednesday, July 3. The Chiefs return home the following week and Thursday, July 11 is Sitcom Night. Friday, July 12 is Peoria Distillers Night with Dueling Pianos from Spanky Entertainment. Saturday, July 13 is Margaritaville Night. Princess and Pirate Night is set for Sunday, July 13 with Elsa, Tiana and pirates on hand from A Royal Remembrance. Monday, July 15 is Super Splash Day with a 12:05 p.m. start. The final homestand of July kicks off on the 27th with the second Faith & Family Night and a post-game concert by Austin French . Sunday, July 28 is LEGO Night with characters and a helicopter LEGO drop. The final home game in July is on Wednesday the 31st and it is Field of Dreams Night. The homestand continues on Thursday, August 1 with the Chiefs first ever Pride Night and Friday, August 2 is Harry Potter Night. The Chiefs return home on Saturday, August 10 with a second Hero Night, featuring appearances by Marvel's Spiderman and Captain Marvel. Sunday, August 11 is Homer's Birthday, presented by CityLink, Toy Story Night and Back to School Night. The next homestand kicks off on Saturday, August 17 with Youth Sports Night, followed by Minions Night on Sunday, August 18. Thursday, August 22 is Video Game Night and Social Media Night. The homestand concludes on Friday, August 23 with Spider Hill Fright Night featuring characters from Spider Hill. The last regular season home game is Fan Appreciation Night on Friday, August 30. Last week the organization announced bobblehead giveaways and earlier this week 22 fireworks nights were announced and information is available on the team website at www.peoriachiefs.com. Additional promotions, theme nights and specialty jerseys won by players and auctioned to fans will be announced later in the off-season.